What Does Drowsy But Awake Mean Anyway, When It Comes to Helping Your Baby Sleep? Pick up any book about baby sleep or read any website, including this one, and the instructions are to put your baby down “drowsy but awake” in order to teach your baby how to sleep and stop waking up at night or nap longer during the day. But, what does “drowsy but awake” actually mean? Does it mean eyes closed or just relaxed? This article will paint a picture about the ideal drowsiness to help your baby or toddler sleep better. In a perfect world, you’d soothe your baby to the point of being calm, relaxed, and eyes closed. You’d lay your baby down, she repositions, flutters her eyes, briefly looking at you leaving the room, and drift off into peaceful sleep. Of course, this doesn’t always work very easily. For some of your babies, they go from wide awake to asleep. 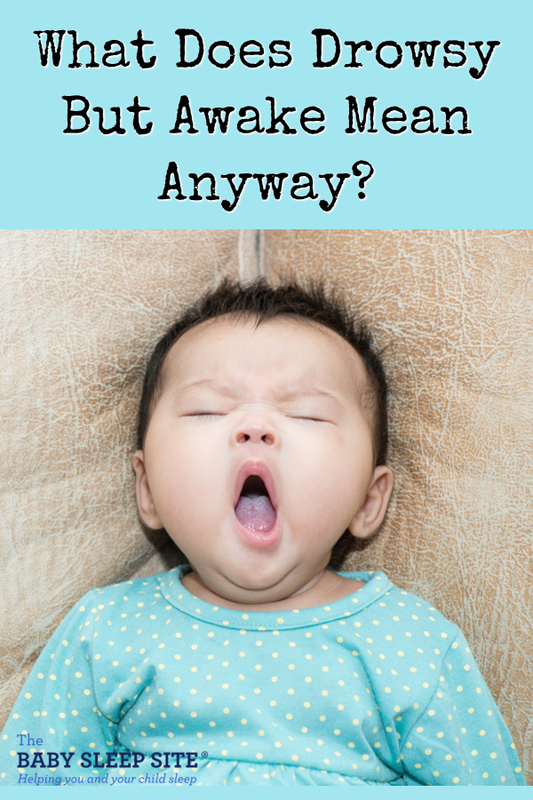 There is not much of a “drowsy” state with your baby. In this case, your “drowsy, but awake” would be somewhere in the calm state, but not with eyes closed. He may appear wide awake, yet content enough to not be moving around and crawling, walking, or playing. How Hard Should You Work on Drowsy, But Awake? In a perfect world, we’d get our babies drowsy every single time we put them down for sleep, but is this really realistic? Is that a good idea? How hard should we work at this ideal state? In my opinion, when you are first sleep training, you will want to have your baby as calm and relaxed as possible before you start teaching her a new routine or skill. However, I do not recommend you take soooo long getting to the ideal state of “drowsy, but awake” just to put her down. First, if you are teaching her a new routine, she is likely to perk up and wake up a bit anyway, once you lay her down. You don’t want to spend an hour and then watch it come undone in a matter of seconds. Second, you don’t want your baby overtired, which will work against you. If you work for 30 minutes pushing her past her comfortable awake time, she is likely to get more upset, faster, and resist the new routine even more. Third, work at it a long time and you have to redo it each time she cries, unless you are doing controlled crying or cry it out, anyway. In that case, you are really just dragging out the inevitable. If you are doing a no-cry sleep method, you still don’t want her to be overtired by the time she is laid down. Ultimately, your goal is to create a consistent bedtime routine or nap time routine and stick to it. If you have an age-appropriate baby sleep schedule, your baby should be content at the end of your routine and over the course of weeks, you should be able to have your baby less drowsy and more awake (depending on your baby’s temperament) as she gets better and better at falling asleep. While my eldest son (who inspired this site) always resisted nap time for 5-10 minutes, his younger brother got to the point where you could say “nap time”, put him in his crib, and walk out. He’d play for about 10 minutes and fall asleep. It was seriously that easy, but it didn’t happen overnight. It did take time and consistency to get to that point. They both just have different personalities. When you are first sleep training, I recommend spending up to 10-15 minutes getting your baby “drowsy, but awake” and then cut it off (I don’t mean the whole routine is this long, I mean just the soothing portion). If he isn’t drowsy with your soothing methods, make sure you are trying sleep at the right time. Too tired might look like lots of crying OR hyper-activity. Under-tired can be playful and happy, smiling up at you, rather than getting sleepy. Cute, but not ready for sleep. What Does Your Baby’s Drowsy, But Awake Look Like? Please let us know if you need any more help, we have a ton of resources available that can help you. Thanks for visiting! Hi, my 4.5 month old starts yawning after 30 mins of being awake (the time it takes to nurse him). He’s yawning as I burp him and is staring off in space. So I read his cues and try to put him down for a nap. I swaddle and rock and he goes to nurse and I usually end up nursing him into a deeper drowsy state, but he wakes a few mins later. I’ve tried not nursing him, but he just cries and cries. Help! I feel like he should be able to stay up longer than 30 mins, but I don’t want him getting over tired. He sleeps 10-12 hours at night, no waking, no dreamfeed. And has put himself to sleep a few times for nap time and also will sleep occasionally in the stroller. What am I doing wrong?? I hope this helps! If you need anything else, please let us know! Hopefully these resources can help give you more of an idea of what’s going on, but if you need more help please let us know! We have so many resources I didn’t want to overwhelm you. Feel free to contact us directly as well at contact@babysleepsite.com and we’ll be happy to help you more from there. We just started trying to put down our 4.5 month old drowsy but awake, (last night was night two) and I’m wondering if it’s normal/helpful if baby still doesn’t sleep after 3 hours. Previously, we’d bounce or nurse him to sleep, then put him down fully asleep. Although we had a few awful nights after his four month sleep change started (he’d wake up every tune we put him down), he recently progressed to a 5-6 hour stretch in his cosleeper. He’d fall asleep between 6:3 and 7, then we’d do a dream feed around 10, and he would sleep 5-6 hours straight after that. Fast forward to the drowsy but awake attempt: we just finished night two, both nights he cried on and off while dad soothed him without picking him up (mostly), and this went on from 7-10. Both nights he been awake at dream feed time, so dad fed him (bottled breast milk), and then he fell asleep in dad’s arms while dad was holding him upright (we hold him upright for 15 min after eating to reduce spit up). So is it worth it to try drowsy but awake if baby didn’t fall asleep within 3 hours? What about baby falling asleep in dad’s arms after a “dream feed?” does that negate all baby and dad’s hard work? Hi @Shoshana, thanks for writing to us. I’m sorry to hear you’ve been struggling with your son’s sleep these past few weeks. With any sleep training, it can take a few days for your baby to catch on, so I would recommend sticking to your plan for 5-7 days at least, unless of course you are feeling uncomfortable or like your baby is in distress. But it sounds like his dad is very supportive and you two are working very well together on this. Let us know if you need anything else! Hang in there! Hi @Amanda, thanks for writing to us. I am sorry to hear you’ve been struggling with your son fully waking up when you put him down. How old is your son? I’d be happy to send over some more information that may help, but I want to make sure to send over age-appropriate material. 🙂 Hang in there! @Amanda, woah, I definitely just reread your initial comment and I have no clue why I did not see that you told me his age from the beginning! I’m sorry! If you need more help, let us know! And again, I’m sorry I totally overlooked your first comment, I don’t know what was going through my brain when I replied to you initially! I would love some advice about knowing if my almost 2 year old is ready for sleep or needs to sleep earlier? Her bedtime routine is generally 30 minutes (bath, lotion, jammies, say good night) but then she has to ‘read’ or go potty or go get water before she even starts to have one yawn. I’m not sure if she transitioned her bedtime to later, (used to be 7pm) but now, it’s taking 45 minutes to an hour to even get her to appear sleepy. What am I doing wrong? We rock together in the glider, then once she lets me lay her down, she’ll fall asleep on her own. I just don’t know how to get her ready for sleep sooner. @Karla – Thank you for reading and for sharing with us. My, my, my, those toddlers sure do know how to stall bedtime and I’m speaking from personal experience. I feel your pain! 2-year olds go through some sleep changes and another sleep regression that impacts their sleep and behaviors – many of them need MORE awake time before sleep times, too. Here’s an article that you should find helpful that goes over this a bit more: https://www.babysleepsite.com/toddlers/5-things-about-2-year-old-toddler-sleep/ Hang in there, Karla! We moved and sleep got all messed up. My 10 month old doesn’t seem to ever get drowsy. Even when he was younger I always struggled with this. I feed him and sing at the same time, brush his teeth, burp him and rock him for a bit but he usually starts flaring in my arms so I just end up putting him down where he then cries for sometimes an hour. I am in his sleep window and try to keep a tight schedule. Hi @Jennifer – Thank yo for visiting us! I am sorry to hear that your little guy is having a tough time and crying quite a bit before he falls asleep! Moving can disrupt even the best sleepers, and hopefully things will smooth out soon as you all settle into your new home! And, unfortunately, some babies do no t have obvious tired signs too! At his age, and because he is not showing you those helpful drowsy signs, you may want to keep watching the clock as you have been, and keep working on finding that right sleep window! One of our expert sleep consultants would be happy to help create and get to a good schedule for his, and to help you through this! Hang in there Jennifer and good luck!! @Monica – Thank you for reading and for your comment! It sounds like your little guy’s calm nature is carrying on during his sleep time, which is great news! If your son is calm and content lying by himself before he goes to sleep, feel free to leave him be as he learns to sleep on his own. Best of luck to you both, and please stop back by to see us again soon. This is a good description. I had a rough time with my older daughter’s sleep and have been determined to do better with my now 5 1/2 month old. I thought I’d been achieving “drowsy but awake” with her and she’s slept through the night (a 7-10 hour stretch) consistently since 8 weeks old. She has recently been sick and for the last 7 nights, has been up every 2-3 hours. Because I’m tired and she’s still coughing / runny nose, I’ve been letting her fall asleep before I lay her down and I feel like I’ve ruined the work of the past 5 months! I’m getting ready to move her to her crib (from a bassinet in our room) and start some new sleep habits but I’m already so anxious because of what I went through with my older daughter. Thanks for the info on your site! Being able to relate to that state made it easier to spot it in my baby. I like your explanation of how long soothing should take, etc. It’s a great reminder now that our second has arrived, and we want to get off to a better start than we did with #1!